One of the most common sights in any Kenyan neighbor hood, the eggs and smokies on standby are the newest most popular indulgence in Kenya today, with the biggest effect being felt in Nairobi. Its basically boiled eggs and smokies with traces of scantily made kachumbari and sauce, maybe even chilli, sold at double the buying price, sometimes more. 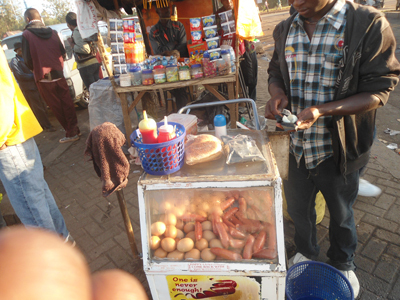 The egg will cost 20 bob, maybe more, same as the smokie although the price of the latter changes with location. In more affluent neighbor hoods it’s much more expensive. It is easy to say that these two have become the new drug in town because they are so damn addictive, once you start you want to have more, and more, even if not right away. Eggs and smokies were not always the kings and queens of fast food indulgence in Kenya. In fact a few years ago eggs were restricted to big hotels or eating joints and homes and smokies were a reserve of the well given in society, I for one knew about them much later in life. The oldest I know of, and love religiously, is the roast maize (corn), or boiled, sold in pieces valued at as little as 5 bob. Many people in Nairobi buy this in the evening on their way back home from work, or something. It’s something you eat for the sake of it, and you can take it with the evening tea. Best part being you will always find them, easily, all year round, unless of course you live in the same hood as the president. There are also others like the very famous mutura, a delicacy made from unwanted remains from the slaughter house, the world famous chips, and chicken, and also great showstoppers like nyama choma, which makes a very good lunch and is dearly loved by public officers and the rest of Kenyans who want to show off to their pals. Roast peanuts are also a common sight, that I also like very much, especially to do alongside mahindi choma (roast maize); the aroma it gives is just so amazing, and being a food conscious chap, its much healthier and fewer in caloric content than all the rest so far mentioned. There is this myth about mahindi choma together with njugu karanga(roast peanut) and boilo (boiled eggs) will boost sexual stamina, as the young men of Kenya put it. In my opinion thats all bull, not that I haven’t tried, and that I have can also not be told here. But its not uncommon to hear someone give it as a reason, or be asked if that is your reason for having any or all of the three.